Huggles loves to hug. He gives a hug to the dog, and another to the cat. But where does Huggles’ hug go? 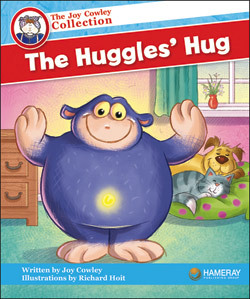 In this adorable picture book, the reader watches as the hug is passed around from one person to the next, finally ending up back at Huggles. Since this book is meant for classroom use, lesson pointers for teachers are provided for guiding discussions about this story. Features like punctuation, alliteration, circular story, and text written in the present tense are summarized at the end of the book. Kids know how nice it is to receive a hug. But in this story, they learn that hugging someone else can have far-reaching consequences of goodwill. I highly recommend this fun teaching tool for kids.